Does Lottery Winner University Really Work? Read Reviews! Lottery Winner University by Richard Lustig is yet another product by the man who claims to have cracked the lottery code. This system, however, is as questionable as all other Lustig products. Anyone who has at least basic interest in predictive lottery software has come across the name of Richard Lustig. Lustig was working hard to build a career out of the fact he has won the lottery numerous times. We’ve already reviewed some of the products he has released on the market – Lottery Dominator, Lotto Decoded, and Auto Lotto Processor are just a few. It seems, however, that all of these costly products weren’t enough. Lottery Winner University is the newest market release and just like all other Lustig creations, it’s supposed to increase your odds of hitting that lottery jackpot. Does Lottery Winner University work, however? We’re about to dissect the available information and find out more about exactly what it does. What Is Lottery Winner University and What Does It Do? Is Lottery Winner University scam? Not exactly because it doesn’t make grandiose promises. It seems that Lustig learned from the criticism directed towards some of his other products. The Lottery Winner University presentation is pretty plain in comparison to some of the other options mentioned above. 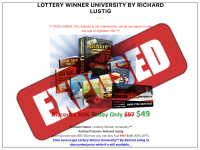 According to the official product page, Lottery Winner University by Richard Lustig is a program aimed at increasing your odds of winning the lottery. Lustig has described his Lottery Winner University book as a comprehensive set of tips that will give you the information required to predict up to six numbers on your ticket. There’s a special formula that Lottery Winner University provides to participants in the program and this formula will supposedly increase the odds of claiming a prize exponentially. Supposedly, all of the information in the program is based on Lustig’s experience. Supposedly, Lustig used this information over the past 20 years to win prizes worth more than one million dollars. If this is really the case, however, a logical question arises. A millionaire who invests his lottery prizes in a smart way would have no need to launch dozens of programs on the market. Most of Lustig’s programs charge a ridiculous amount of money, especially when you consider the fact that similar opportunities are available for free. Hence, can you really trust a man who claims to be a lottery millionaire but who still needs to push dozens of questionable software solutions out there? We leave the conclusion to you. How Much Does Lottery Winner University Cost? This is the big shocker! The Lottery Winner University PDF, just like all other Lustig products, comes with an incredible price tag. The sum he’s asking for is made even more ridiculous by the fact that potential buyers don’t really know what they’re getting. There’s no evidence demonstrating the effectiveness of Lustig’s approach. If the formula was so fool-proof, Lustig would have made billions from the lottery by now and he would have retired on his own tropical island. Lottery Winner University by Richard Lustig is priced at 49 dollars per month! That’s right, folks! You’ll have to spend almost 50 dollars every single month to ensure access to Lustig’s wisdom. Currently, however, the program is being advertised at a discounted rate of four dollars. Once you sign up, however, the standard monthly charges will apply. Lottery Winner University is sold via Clickbank, which means that you’ll at least be offered some level of protection. Clickbank ensures a 60-day money-back guarantee. If you buy the Lottery Winner University book and you’re not happy, you will receive a refund within the specified timeframe. How Does Lottery Winner University Work? We believe that Lottery Winner University works in the exact same way the other Richard Lustig programs do. Supposedly, Lottery Winner University will help you eliminate unfavorable numbers and stick to the ones that are more likely to be drawn. If you think this description sounds vague and unconvincing, you’re absolutely correct. Richard Lustig has claimed multiple times that his strategy for winning involves playing the lottery big time. He has spent a lot on the acquisition of tickets and this is the one thing nobody seems to mention. Yes, he has won the lottery several times. How much money, however, did Lustig have to invest in tickets in order to secure a prize? People have reported Lustig’s other programs multiple times already, claiming they are nowhere near as good as the creator claims them to be. Lottery Winner University reviews claim that Lustig is a liar and a fraud who’s only interested in generating a bit of cash. Keep in mind, however, that Lustig was a clever cookie. He created affiliate programs for all of his products, including Lottery Winner University. This means that websites referring traffic and helping for the generation of sales will earn a nice commission. Thus, you will come across numerous positive Lottery Winner University reviews. These, however, tend to be quite generic and they’re usually written by people who have never given the program a try. Are there strategies out there to increase your odds of winning the lottery? Yes! These often rely on algorithms calculating hot and cold numbers for the respective game. Lustig doesn’t make such an algorithm available, which is why you should be extra-cautious about spending 49 dollars per month on his program. The standard Clickbank terms and conditions apply to the Lottery Winner University program. As already mentioned, you will get a 60-day money-back guarantee in case you’re not happy with Lustig’s ebook. Obviously, the terms and conditions state there’s no guarantee of winning anything if you buy Richard’s product. That’s a standard legal disclaimer but it makes you wonder about the authenticity of the tips and their applicability to a winning lottery strategy. The terms and conditions also state that Lottery Winner University reserves the rights to modify the terms and the conditions at any given time. Hence, there could be changes in the monthly program in the future and there’ll be nothing you could do about them. Who is Behind Lottery Winner University? Richard Lustig bragged a lot about the large sums he has claimed from the lottery. The truth of the matter is, however, that his track record wasn’t that impressive. The last time Lustig won anything was in 2010. He claimed 98,992 dollars from Florida Fantasy 5. The biggest prize he has ever claimed came in January 2002 when he won 842,152 dollars from Florida Mega Money. Since 1993 (and up to 2010), he won several times from scratch-off games, as well as local Florida lotteries. Most of the sums are far from truly impressive. Lustig’s philosophy was based on two main approaches – always playing the same lottery numbers and buying scratch-off tickets in batches of 10 consecutive tickets or more. Anyone who has even basic experience with the lottery knows such tips are pretty standard and they have been out there for a while. Once again – remember that Richard Lustig never told the world how much money he spent on buying lottery tickets. It’s quite possible that the expenditure offsets the prizes. After all, the last time he won anything was nine years ago. Richard Lustig passed away in the summer of 2018 at the age of 67. All of his programs and the controversies surrounding his lottery winnings remain out there. Lottery Winner University is probably the last Lustig program but chances are that it doesn’t offer anything radically different from the previous ebooks. Would you mind rating Lottery Winner University? If you’re still not certain whether you should buy the program or not, do a bit of online research. Googling Richard Lustig will give you a ton more information about who he is and what he does. There are numerous Lottery Winner University reviews, as well, and they will acquaint you with the actual experience people have had with the program. We believe it’s in your best interest to stay away from anything created by Richard Lustig. His programs aren’t revolutionary and they’re not going to reveal a big secret. The fact that you’ll be charged on a monthly basis is also off-putting. You can easily find free of charge lottery programs and software solutions that will charge you a single time for lifelong access. Because of the questionable reputation of the program and the vague information provided, we give Lottery Winner University a 1 out of 10 stars rating.